This is the season to be jolly; there are many things to be thankful for and give love for. Loved ones that stay by your side through thick and thin, success with personal projects, and strength obtained from the tough times provide great things in each of our lives, and this Christmas is the best time to express how you feel, though we really do not need a designated holiday to do so. Nonetheless Christmas is a great time to do so if you have had a hectic year, which happens a lot. Here at Silver Oak Online Casino, we also tend to get overly wrapped up in all the commotion and intensity of bringing our customers the best possible online casino experience that we forget to give our best wishes to all of you as well. This year has been a very successful one for us and for our players. Many players have won large sums of money, and we love to see that. Nothing is more rewarding for us than making our players happy with our long list of really fun games and the pay outs from the games. That is true success in our eyes. That is what a casino is really about. Sure, people play for the money, but the entertainment and satisfaction factors are the real clinchers when it comes to making the difference between a good casino and a sub-par casino. All of us her at Silver Oak strive every day, even holidays, to make sure we bring you the high-quality service we have been providing and will continue to provide to our beloved customers. So, please receive this cordial greeting as our way of saying thank you for choosing to play at Silver Oak Online Casino. We wish you and everyone in your family the merriest of Christmases, and the best wishes for the New Year. 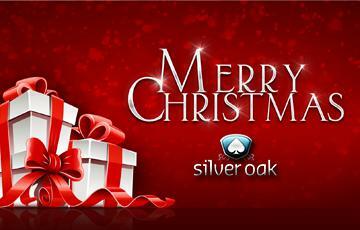 We hope the holidays are well spent with plenty of rest, relaxation and quality time with your loved ones, so Merry Christmas and Happy New Year from Silver Oak Online Casino.